Erika grew up on the beaches of Rio de Janeiro, specifically on the street that led to the main site of the 2016 Rio Olympics beach games. Being raised in an environment that cultivated fitness and wellness as the daughter of a classical ballerina and a beach volleyball player, Erika got into movement from an early age following her mother’s footsteps in classical ballet before moving on to the gym activities of the time. While still in high school in Miami Beach, she taught fitness classes at local gyms and dedicated time during class to long hold stretches and slow long breathing. 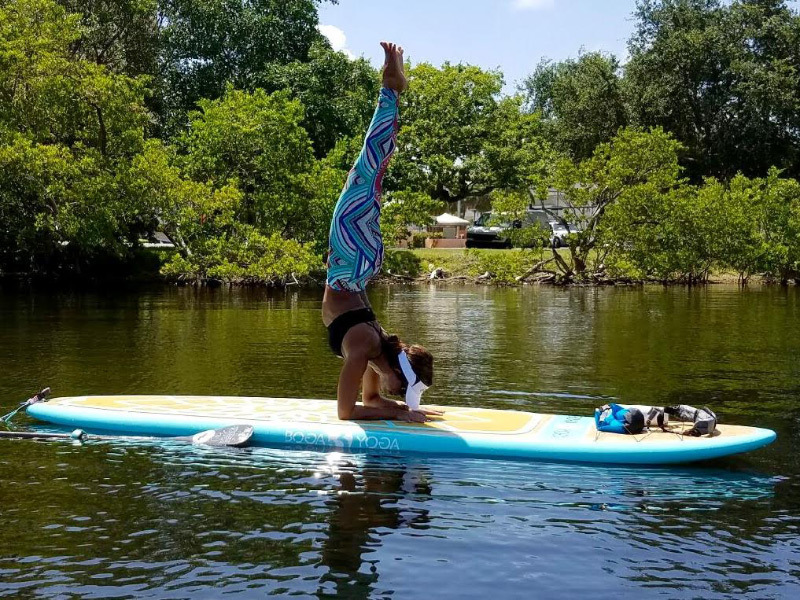 She first practiced formal yoga while living in New York City in the mid-90s, but it wasn’t until 2008 that she dove head first into the practice, getting her certification to teach vinyasa flow yoga in 2010 in Delray Beach FL. SUP Yoga came naturally while trying a paddleboard for the second time ever in early 2012 (almost three years after the first time! ), and soon after she joined a fellow teacher to offer classes throughout South Florida. 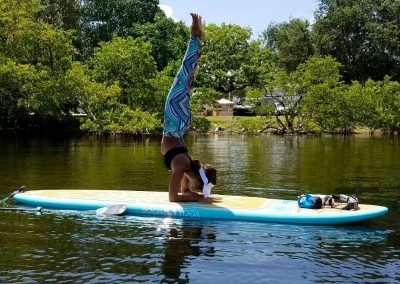 Erika continues to share her love of yoga on water in all-levels classes that are accessible to all ages, all bodies, and all walks of life, in an effort to promote the benefits of a practice surrounded by the earth’s natural elements. Favorite Yoga Destination: Anywhere near an ocean. Favorite Mantra: Go where the light is. Never leave home without: A reusable, hydrothermal aluminum bottle of fresh water. Where does Yoga take you: Back to my real, essential self. 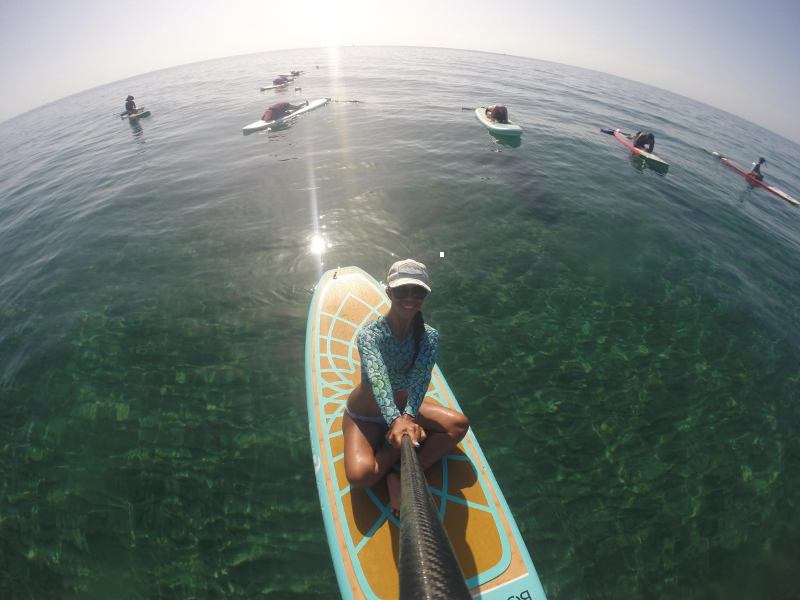 What BOGA Yoga is to me: BOGA created the first recognizable, relevant yoga paddleboard of our time. Years later, seeing dozens of floating studios and festivals throughout the globe flowing students and teachers on BOGA Yoga, to me it is simply… Pure bliss. When I set my feet on my Boga Yoga and ground them on deck, it’s as if the entire mundane world melts away. I am free to flow through my practice and to connect with nature in a way that every human being is meant to be connected. Favorite activities besides Yoga: Training and racing on my BOGA Typhoon, road tripping, and spending time with my 17-year old son Dylan. Favorite pose: Whichever pose I choose to practice at that moment – that’s my favorite. Best thing about SUP Yoga: The sway on the water, the movement below me while I am moving above. Favorite Food: Anything light, colorful, organic and loaded with nature’s flavors and olive oil. Oh, and chocolate cookies. Any kind of chocolate cookies. Why do you teach Yoga: I love teaching. Yoga is just one of the things that I share. Teaching for me is an act of service and I find myself like Hanuman in that way. I’m very passionate about my practice and about sharing. Yoga shared with the intention of love can be very helpful and healing. I teach because it is an expression of love and we all need more of this type of expression in our culture.